Spurred on by the impending sunset of New York City’s rent stabilization laws -- and an attack on tenant protections by Albany Republicans and Right Wing Democrats -- housing organizations, unions, community and political organizations are planning a major offensive. The campaign will include demands for NYC home rule and provisions bringing protection to unregulated tenants. Since 2005, the Real Estate Board of NY and the 37 companies comprising its leadership have contributed $43.9 million to state and local candidates, committees, and PACs. Common Cause/NY’s analysis reveals that the State Senate is the top recipient of REBNY money and that the overwhelming amount flows to lawmakers who represent districts outside of New York City. No wonder Upstate legislators don’t want home rule for New York City. The campaign to restore New York City’s home rule over housing laws seeks to repeal the 1971 Urstadt Law, which took away NYC’s power to pass rent laws more stringent than the State’s. The campaign will proceed on several fronts. One is to mobilize communities around the city to join the call through a series of town hall meetings in partnership with local elected officials. Planning is now underway. Another major focus will be in the City Council where the Progressive Caucus has made home rule part of its platform. A constitutional challenge to the Urstadt Law is also being considered. The State is clearly unable to protect New York City’s tenants. We must have home rule. 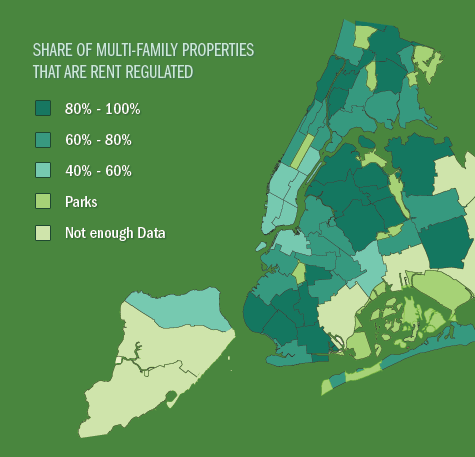 Two-thirds of New Yorkers rent. 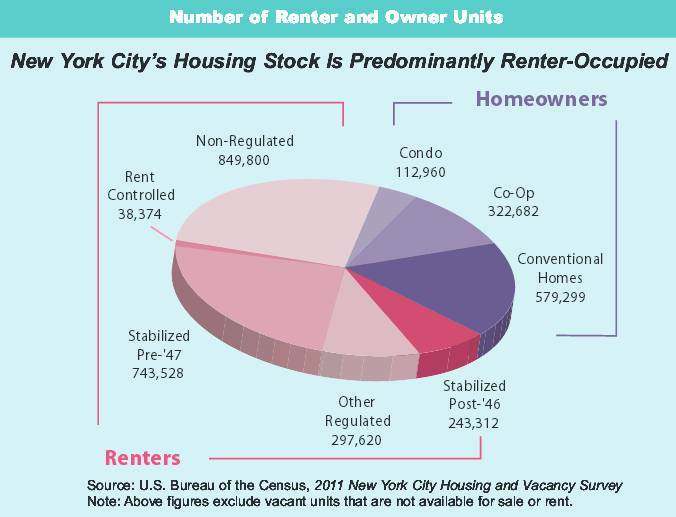 45% of them are rent stabilized, 39% are market-rate units and 16% are regulated in other ways. Just under one million apartments continue to be protected by rent stabilization. Stabilized rent still goes up, but at a regulated annual rate determined by the city’s Rent Guidelines Board. Along with protecting tenants from huge spikes in rent, stabilization gives tenants the right to renew their lease. This guarantee of home stability is crucial to New York City’s working families. According to 2011 data, 93% of rent-stabilized buildings (and 94.5% of all residential buildings) turn a profit. The average rent-stabilized building generates a monthly profit of $400 per apartment plus appreciation. The tentative deal announced Tuesday must still be approved by lawmakers. The agreement was announced largely without specifics, and without bill language spelling out what had been negotiated, making it difficult to determine what, exactly, had been decided. In the final days of negotiations, the future of rent regulations loomed as one of the most pressing issues. The rent laws had expired on June 15, though lawmakers later agreed to a temporary extension as negotiations continued. The agreement would extend them by four years. The Assembly, controlled by Democrats, had pushed to strengthen rent regulations so that fewer apartments would become market rate in future years, but it faced opposition from the Republican-controlled Senate. But tenants’ advocates were disappointed with the deal on rent regulations, which also cover some apartments in the suburbs. Michael McKee, the treasurer of the Tenants Political Action Committee, said the changes would have a negligible effect on the deregulation of apartments. Enclosed are petitions signed by 950 of your constituents calling on you to act in the best interest of the 65% majority of New Yorkers who rent, by renewing and strengthening rent regulation laws, inluding ending vacancy decontrol, extending protection such as the right to lease renewal to all tenants, and ending the 421-A tax break which is costing the City over one billion dollars a year by providing tax breaks for millionaires. The Club thanks all of our members and neighbors who helped with and signed the petition. Tenants rally on the steps of City Hall for Rent Stabilization and Home Rule. Three Parks members were posing for a group photo on the second weekend of petitioning when a neighbor stepped up to sign. On the totally fallacious theory that developers won't build in New York without it, the 421-a law gives a ten to twenty-five tax abatement to just about any new apartment building in residential parts of the city. This law expires on June 15th 2015 at the same time as rent regulation setting off speculation about a possible deal. In recent years, this tax break bounty was extended to some of the City's most luxurious buildings through an Assembly bill sponsored and promoted by the Housing Committee Chairman, Keith Wright who is also the Chair of the Manhattan County Democratic Executive Committee. The most notorious example is the condo tower at 57th St. near Central Park knows as One57 where a tax abated penthouse apartment recently sold for over $100 million dollars. The NYC Independent Budget Office estimates that in 2013 alone, 421-a cost the City over one billion dollars in forgone revenue. Astonishing Program: With this program, you can locate any 421-A tax abated building and learn how much the City is losing, how long the abatement lasts and whether or not any of the units are affordable. E-Mail Governor Cuomo. Tell him that he must strongly and publicly press the legislature to renew rent regulation laws when they sunset in june of this year and that you support repeal of the 421 tax break for developers. A June, 2014 report from the Furman Center of NYU. Good incomes information to dispel landlord myths that stabilized tenants are all millionaires who really live in Florida. What is a Rent Regulated Apartment?